Q: What about students who are not US citizens? A: Only US citizens can vote, so no, they cannot register. Green card holders / permanent resident aliens can not register. It would behoove any of us to test ourselves on the questions to become a US citizen: https://my.uscis.gov/en/prep/test/civics/view How did you do? Q: Once I register, everything is set, right? Q: Once I’m registered, can I vote anywhere I want? Q: Do I register by party? Help! How do I decide? A: Never fear! We DO NOT register to vote by party in Virginia. Virginia is an Open Primary state which means that any registered voter in Virginia can vote in either a Democratic or Republican primary. When both parties are holding a primary election, that is called a dual primary. You will be asked which primary you want to vote in when you check in to vote with your photo ID. Note, you may only vote in one primary. Q: Can I register to vote online? A: Maybe! If you have a Virginia drivers’ or DMV Number from your learners’ permit, then yes. Otherwise, you can start the voter registration process online, then print out the form and mail it in. Q: Can 17-year-olds register to vote in Virginia? A: Yes! As long as they will be 18 by the next General Election in November, they can register to vote. Q: OK, so many 17-year-olds can register, but can they actually vote in Virginia? In 2019, registered seventeen year olds will be able to vote in the June 11th primary. Q: Can I vote absentee? A: There are 20 reasons to vote absentee in Virginia. Being away in college is a valid reason. If you come home for fall break, you could probably vote on a Saturday at an absentee voting site in Fairfax County. Otherwise, you will need to apply for an absentee ballot. And you know what you need to do with the absentee ballot? Fill it in, SEAL the envelope, SIGN the envelope, have a witness sign the envelope, and put a STAMP on it. Mail it way early, too, so that it is received by Election Day. Heard of a stamp, but never actually used one? See store.usps.com/store/results/stamps/_/N-9y93lv Ask for stamps for high school graduation gifts!!! A: Federal law requires the US Post Office to send a notice to the Office of Elections with any change of address. The Office of Elections will then send you a postcard verifying the change. Pay attention! This is a big reason that people end up having a problem with their registration. Q: Do I have to re-register every time I vote? A: No! But you can only be registered in one place. So, if you register at college and you had already been registered at home, double check to see where you are registered before you go to vote at the Virginia Citizens’ Portal: elections.virginia.gov/index.html. Q: What about students whose parents are in the military and hold residency in other states. 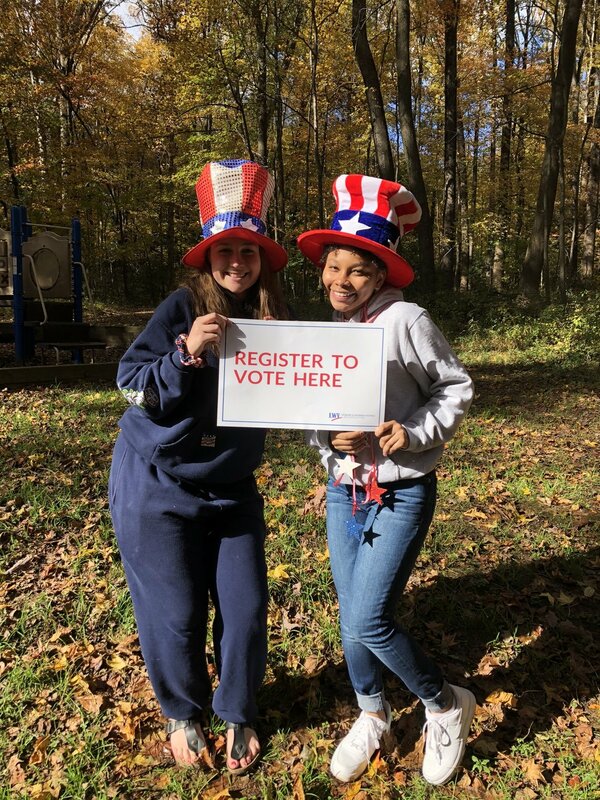 Should these students register to vote? A: These students do need to talk to their parents to see where their parents would like them to register to vote, whether in Virginia or elsewhere.